The FIRST-EVER meeting on managing menstrual health for women and girls in East and South Africa was held this past week in Johannesburg, South Africa. A ground breaking initiative, the Menstrual Health Management Symposium aims to bring together the many different programs and policies that already exist surrounding menstrual health and develop a sustainable, scalable framework which is cohesive across East and South Africa regions. To strengthen commitment and build on the latest evidence base, to move from research to action, and to demonstrate innovative, sustainable and scalable models to address the menstrual health management needs of adolescent girls and women throughout their menstrual life cycle in East and Southern Africa. Across the globe, a lack of access to menstrual hygiene products and a lack of widespread education contribute to cultural stigmas against menstruation. “African sexuality is very much a hidden thing… [but keeping it hidden] perpetuates stigma and discrimination. In Ethiopia, menstruation is a taboo subject. As a result, girls’ first periods usually take them by surprise; they don’t know what to do, or who they can turn to for help. Although health and biology are taught in schools, the classes do not do enough to change the social perceptions about menstruation — that it is shameful, unclean, and a result of sexual activity – nor do they offer the practical knowledge adolescent girls need to manage their menstrual hygiene effectively. Many girls are forced to use straw or strips of old cloth because they do not have access to or cannot afford sanitary products. The lack of sanitation, fear about accidents and shame of having their period often drives girls to stay home from school during menstruation. With frequent absenteeism, these girls fall behind in their studies and have a higher risk of dropping out early. Not only does this greatly restrict girls’ freedom and opportunity for education, but it is also a tragic waste of human potential. 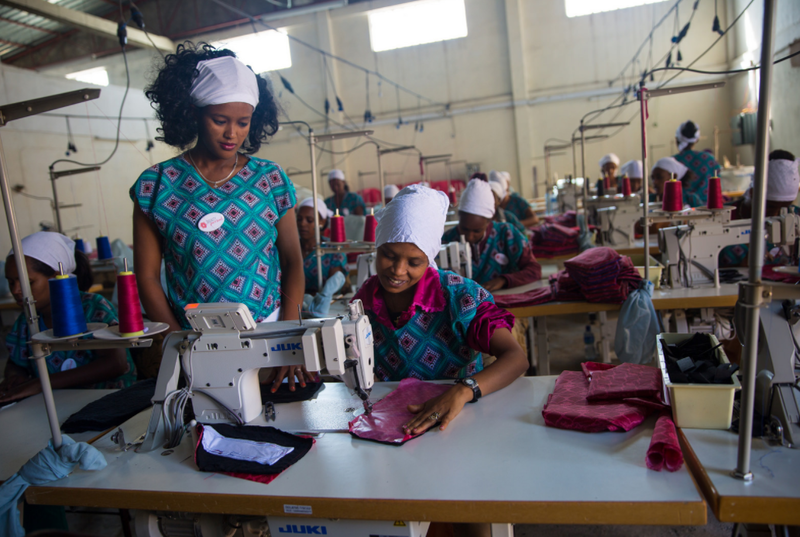 SANITATION | Purchasing and distributing reusable, eco-friendly pads for girls in school, locally manufactured in the Mariam Seba Sanitary Products Factory. RESEARCH | Funding research at the established Mekelle University in northern Ethiopia to explore cultural beliefs and social attitudes around menstruation in rural Ethiopia. EDUCATION | Developing research-based programs to improve awareness and support on issues surrounding menstruation that are sustainable over the long term. Within the field of education, Dignity Period produces a ‘Growth and Changes’ information booklet which provides facts on puberty and menstruation, answers common questions and dispels long-held myths which perpetuate menstruation as shameful. Since launching the Menstrual Dignity Project in Ethiopia in 2015, a huge 73,197 students have been reached with information booklets and sanitary products for improved menstrual management. The menstrual management programs we support through Dignity Period are just one part of a wider chain of programs spanning many different sectors, channels and organisations. The Menstrual Health Management Symposium aims to look at a wider picture of menstrual health across Africa by collating evidence and research from the many different programs in place and using this knowledge to drive more unified, scalable solutions for menstrual management. Together we can help shape menstrual health in rural areas of Ethiopia and take the steps needed for sustainable change. Reusable sanitary pads are an effective and immediate way of improving menstrual hygiene and management. Dignity Period purchases these sanitary pads locally from the Mariam Seba Sanitary Products Factory and distributes them to girls in rural schools who could not afford or access these products otherwise. For a small amount, you can purchase a Mariam Seba sanitary pad to help a girl in school manage her period with dignity. If you would like to give a gift of dignity, please visit our Donate page. A small gift will make a big difference for a girl in Ethiopia.